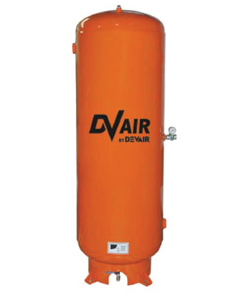 We offer a complete range of compressed air tanks. They are sized from 30 to 1000 gallons. They can be remote or can come with a mounting plate. Please call to determine your requirements and find out pricing. Auto drains come in a variety of configurations. However, because condensate contains oil, dirt, rust, and water, it is very hard to find an auto-drain that will pass this extremely sticky, corrosive liquid reliably over time. The best solution is to use a drain that doesn’t use the condensate at all. A timed electronic auto-drain will open a valve at regular intervals to drain the water in the tank. 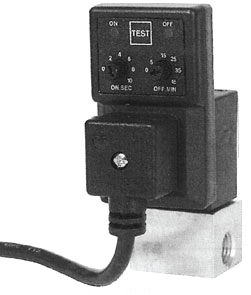 The unit just opens a valve and the condensate runs out – Very simple, Very reliable. The Receiver (a “receiver” is a compressed gas storage tank) is one of the most important components in your compressed air system. There are 2 main reasons to have a receiver. Piston compressors produce pulsed air. The nature of compressing air with pistons creates discrete packettes of compressed air – one after another. Even the smallest piston compressors require a tank to gather those individual units into a whole body of compressed air. Compressors do not produce the maximum pressure right away. They essentially fight the back pressure that is built up in the tank. The pressure in the tank builds up and at a certain point (say 150psi – for some compressors) a pressure switch turns the compressor off. If there was no tank the maximum pressure would not ever build up. If the receiver is not sized correctly or there isn’t a receiver, when there is a demand for compressed air, the compressor would have to turn on immediately. Then when the demand stopped, the compressor would stop. On and off, on and off, on and off all day. This would eventually burn out any motor, in fact, large motors have a limited number of motor starts per hour. For example a true 5hp motor has a maximum number of 8 motor starts in an hour and a minimum of 83 seconds between starts. A 7.5hp has maximum number of 7 motor starts in an hour and a minimum of 88 seconds between starts. Larger motors have less motor starts per hour and longer minimums between starts. All compressors produce water based on temperature and humidity conditions in the environment. The water is in the air, generally speaking the hotter the air the more water it holds. When you compress air you take all that water with it, in the form of water vapour. Also compressing air produces heat. It is a energy function of compression, it produces heat, about 2500 BTU’s per horse power. So the compressed air coming out of the compressor pump is hot and wet. It is forced into the tank and the tank is cooler than the pump (usually room temperature) so the water condenses on the inside walls of the tank, just like when you take a shower and the mirror gets covered in water vapour from your hot shower. This condensate will run down the walls of the tank and settle at the bottom. That is why draining the tank is so important. The inside of air receivers are untreated steel. The condensate will rust the inside of the tank reducing its life span, and worse, perhaps, the rust will get carried down the air lines and into filters or tools. Most people forget to drain the tank and that is why we recommend automatic drains(See Below). The receiver is the first stage of water separation of your compressed air. Sometimes, if the compressor is running for a long time, the heat from the compressed air and the pump will heat up the tank to the point where no water will condense out of the compressed air and all the water vapour will travel into the process piping or shop hoses AND maybe right through the air tools or paint gun or what ever is using the compressed air. That is why sometimes there is a lot of water in the tank and sometimes there is very little (along with the variations in temperature and humidity levels in the environment). Another possibility is that the hot water vapour settles in low areas of the process piping. It is important to try and treat the compressed air and take out the water vapour, if what you are doing requires dry air, like painting, or you are concerned about your air tools. There are many ways to do this Check out our air treatment webpage. Most compressors come with a receiver, the industry standard is 1 gallon of reciever for every CFM delivered. However, the smaller the compressor the more that number stretches. For instance our 5 hp compressors come with 60 or 80 gallon tanks. The most a 5hp compressor can deliver is 20 CFM so the tank size should be 20 Gallons, but in reality 20 Gallons wouldn’t give enough of a buffer for most applications, so our heavy duty industrial compressor is on an 80 gallon tank. In some instances a second remote receiver is needed for some process. Here is a formula to calculate the output of certain size of receiver for a certain demand. Lets say you have a process that requires 10 CFM at 100 psi for 10 minutes in order to shut down properly in case of a power failure. What size of tank are you going to need to achieve this requirement. 1) What is the minimum and maximum pressure output of your compressor. If you know the max. psi is, say, 150 psi then your minimum is probably 115psi for a piston compressor, for a rotary screw it is probably 130psi. Lets assume it is a piston compressor. 2) You need to know the atmospheric pressure for your city. At sea level the atmospheric pressure is 14.69 psi. Lets assume 15psi. 3) The answer is going to give you the size of receiver in cubic feet not gallons. To convert the anwer multiply by 7.48. 42.86 Cubic Feet multiplied by 7.48 = 320 Gallons. You will need a 320 Gallon receiver to give you 10 CFM@100psi for 10 minutes.